The Interrupter Cruiser is the rarest gem in the Imperial arsenal, with powerful Gravity Well Projectors to keep and hold onto the staunchest Renegade Alliance ships. 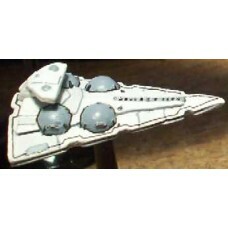 This ship is called in when a mission needs to surprise or interrupt the Alliance sabotage missions by drawing them out and holding them from jumping away before surrendering to the Empire. This support ship has less firepower than the Vanquisher, but has several flights of fighters to keep the projectors online.